In Series2 and Series3 units, TiVo has implemented a new way to search across all accessible video, including upcoming programming, and programming available as downloads from Amazon Unbox and, potentially, other internet repositories. 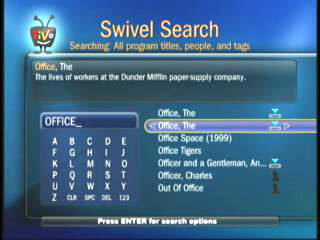 The "swivel" part of the search unleashes even more power, allowing you to hotlink among other ways to search. 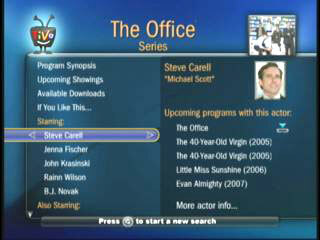 In the example below, a search for "the office" can swivel into a search for other programming containing the actor "steve carrell." Eventually, the TiVo may be able to access video from multiple internet sources, so there's potentially a ton of power behind this search feature. Accessing Universal Swivel Search from the Find Programs to Record menu. Here's the key: Broadcast and Broadband. So you can limit your search to only online content, if/when the respository grows. 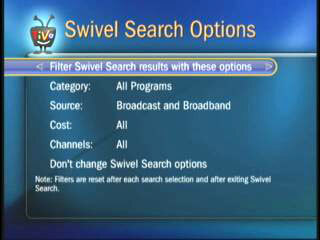 Like searching by title, Swivel Search finds programs that match the entered information. But like a WishList, the search includes more than just the title. And, even better than a WishList, it's a live search, narrowing results as you type. 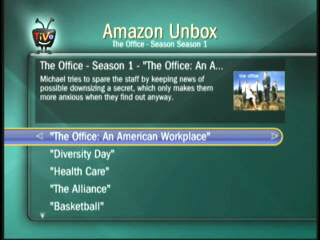 The show is available on both broadcast and Amazon Unbox. 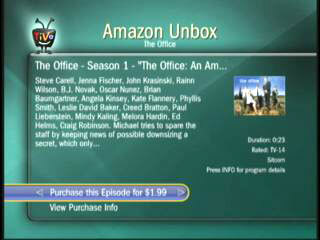 More information about purchasing the show through Amazon. Once you choose the episode, you can pay by clicking the link. Your linked Amazon account is automatically charged for the download, it shows in your Amazon purchase history, and Amazon sends you an email confirming the order. Once you choose a show, the "Swivel" functionality becomes even more apparent. From there, you can drill down into the cast, and choose a name. 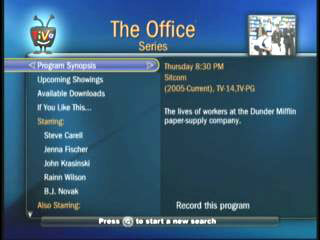 Then, you can pivot on the actor, and see other TV shows and movies of his.